Draw character design tutorial Horus the guardian. 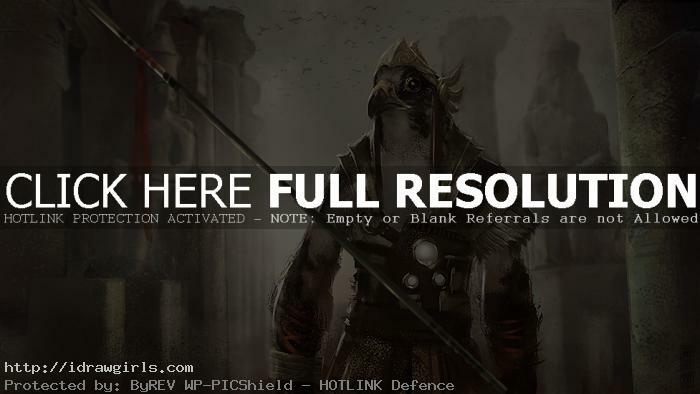 This tutorial shows you how to draw and paint a character design of Horus the guardian character. This tutorial shows you from drawing step to rough semi-finished painting. You can scroll down further to see step by step images with instruction. In this tutorial I start with a rough idea of a Ancient Egyptian guardian Horus. I first explore with human shapes with the head of a falcon in mind. I am using the texture to convey materials and also light and shadow. Then I explore what kind of lighting direction do I want. At this stage, I only focus on big shapes, lighting and base to get the overall look and feel of the character first before I can design the detail of the costume. Once you have a good silhouette with lighting and good form then we can start doing more detail. This time though I struggle a bit in the beginning because I only have vague idea of what I want. But sometime, I will just let the visual shapes and color guide me as I go. Below are step by step drawing Horus the guardian.